Summer fishing with Ben Wilson, Dyllon Schulz & Adam Melling aboard the Mitaia Rua. 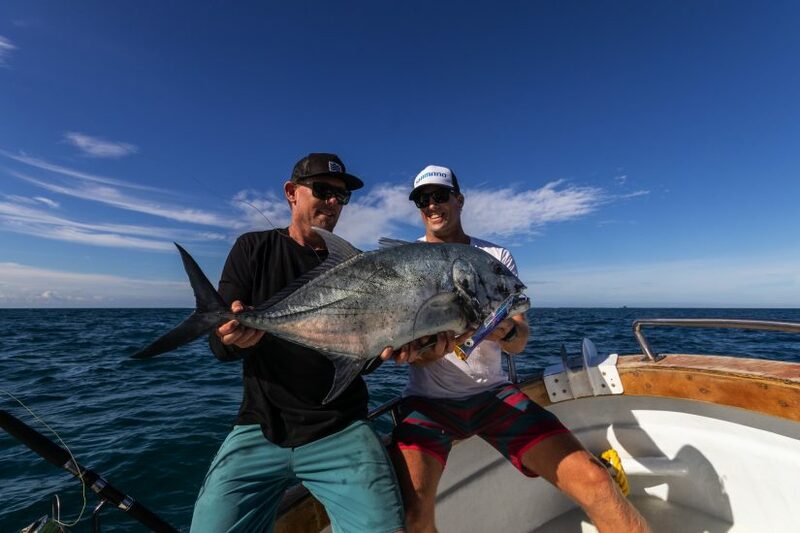 Although Ben, Dyllon & Adam have been fishing this region in Fiji for years, if you’re open to trying different styles of fishing and staying flexible you can find fish in most conditions. Using stickbaits and poppers means lots of opportunity for hooking GTs and Spanish in top-water fishing but if you head into blue water you’ll find wahoo and yellowfin tuna. When jigging, look for dogtooth tuna and other tropical deepwater species. If there’s surface activity like bait balls and birds then it’s a day for top-water fishing. If there’s no obvious activity then there’s more opportunity for GTs, Spanish Mackerel etc in upwellings, ledges and around the deep reef edges. It really helps to have good sounding equipment (we use SIMRAD electronics). Of course there’s a big ocean out there; you can go wide and look for current lines and birds and cast stickbaits and poppers or go jigging for yellowfin. On this particular two-day trip Ben, Adam and Dyllon tried a bit of everything and came back with lots of variety. A pretty standard couple of days fishing on Namotu Island! Find out more about our fishing charters. We operate 1-7 day charters around the Island that are open to guests and non-guests alike.